338 attendees checked in so far! 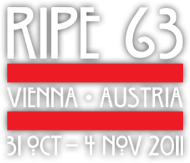 The RIPE 63 Meeting began Monday afternoon with welcome addresses from Rob Blokzijl, RIPE Chair, and the RIPE Meeting hosts, Christian Panigl, UniVie/ACOnet/ VIX, and Robert Schiscka, nic.at. Désiree Miloshevic, Oxford Internet Institute, then gave an introduction of the results of the recent RIPE NCC Membership and Stakeholder Survey 2011 and explained to the attendees that there would be more details given in the RIPE NCC Services Working Group session on Wednesday at 16:00. More information about the survey can be found at: www.ripe.net/survey2011. The Plenary continued with a detailed presentation by Emile Aben, RIPE NCC, on “World IPv6 Day – What Did We Learn?”. He showed statistics from the day itself and concluded that it was a positive experience. Brian Nisbet, HEAnet, gave the first technical presentation of the week and had attendees laughing out loud at his amusing account of HEAnet’s experience with “Cisco CRS-1 & IOS-XR”. The second Plenary session opened with an emotive speech from RIPE NCC’s Chief Scientist, Daniel Karrenberg entitled “Almost 20 Years of RIPE NCC: A Personal View on Current Challenges”. It was followed by a high-level panel discussion on resource certification/RPKI. The discussion, moderated by Olaf Kolkman of NLNet Labs, saw debate on the technical and potential regulatory issues surrounding certification. The participants were Malcolm Hutty, LINX; David Freedman, Claranet; Sandra Murphy, Sparta, co-chair of the IETF Secure Inter- Domain Routing WG; and Steven Kent, BBN. The discussion examined many of the issues surrounding certification, answering some questions and opening a number of other areas for exploration throughout the meeting week. Earlier in the day, a RPKI workshop was held. Around 80 people participated in the event, during which they were able to make use all of the available open source tools and configure routers to base routing decisions on RPKI data. Got Legacy space? register it! Some RIPE 63 attendees received a special letter in their meeting pack asking them to get in touch with the RIPE NCC to register their legacy address space. This is the first step in a phased implementation to contact as many legacy space holders as possible in the RIPE NCC service region. Keeping the RIPE Registry comprehensive, accurate and up-to-date is one of the RIPE NCC’s key responsibilities as a Regional Internet Registry (RIR). Stop by the RIPE NCC Info Hub to talk to RIPE NCC staff or pick up a brochure for more information. Around 35 people attended the “Database Tricks and Tips” session, run by the RIPE NCC, on Monday morning. The session introduced attendees to the most important objects in the RIPE Database, showed simple ways to get precise information and explained the best methods for updating the database. There was also some discussion of geolocation and, based on positive feedback, the session may be offered again at future RIPE Meetings. The Abuse Contact Management Task Force held their fourth meeting on Monday Morning. The goal of the task force is to propose a solution for abuse contact provision by members. The task force will report back to the Anti- Abuse Working Group on Tuesday afternoon. The task force also came up with a policy proposal outline that will be submitted in the coming weeks.